This entry was posted on December 10, 2009 at 11:48 am and is filed under Agility for Small Dogs, Course and Sequence Design, Games and Courses, NADAC, TDAA. You can follow any responses to this entry through the RSS 2.0 feed. Both comments and pings are currently closed. While I can appreciate the technical handling of the “international standard” courses, nothing takes my breath away like watching excellent NADAC handlers working the bonus line. I know I’m not alone because the arena goes quiet when the teams walk out on to the course. I compete in NADAC because my All American wasn’t welcome in AKC. He’s a bit of a velcro dog, and would have been better suited to AKC courses, but over the past 3 years of NADAC competitions he’s learned to do some distance. Now I even look forward to the “Elite Chances” class that I used to dread! Although AKC is changing their rules regarding All Americans, it’s too little too late for my boy, who will soon need to be retired. The rubber contacts also would provide a lot more traction and relief in the teeter in the ‘bounceback’ physics of the board. The hounds start out running a nice teeter, then, after they are experienced and can predict that is going to be uncomfortable, they start ‘walking’ the teeter very carefully. I watch LOTS of dogs do this over time, normal dogs that is, not the suicidal ones that will take any obstacle at any angle and any speed if the handler presents it! Something I have observed my last 3 puppies (Leilah and Holly are now 13 months! Yikes! and JJ is now 5 months) is they got introduced to contacts on the softer surface (and smaller size of course! ), then I accidentally gave them a 4′ x8′ (standard sheet size) of thick, smooth, plywood angled up to an 8′ table in the barn, and they love to “play” on this by running up the side of it, NOT to get on the table, but to SLIDE or run back down it in an arc, reminds me a bit of what skateboarders do in those big rampy things. They are so clearly confident about moving, wiggly and slick angled surfaces now, that they feel like they have total grip on the rough or rubber surfaces! The key of course, is that the dog has positive experience with the traction surface, THEN has exposure and experience with the slick surface, then when we go back to the traction surface, they feel totally in control of their feet. 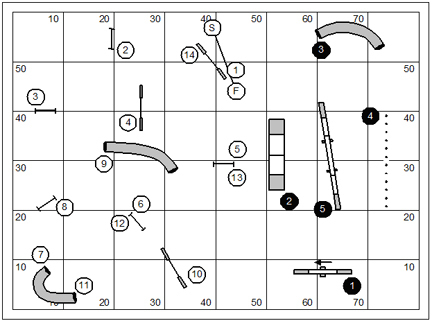 This is much like working reining horses in very thick, “stickier” footing for schooling sliding, then, when the horse competes in a normal show arena, to him, the footing is thin and easy and he feels like he can skate over top of it, and you get better slides! The “accidental” part, by the way, is that I had stored the plywood sheet next to the table, the dogs knocked into it and it slid a bit so it was leaning on the table, one side ‘caught’ in the groove of what was a dairy aisle, and they have been playing on it ever since! Anway, I hope the rubber catches on with other venues!